Do you know the toll free emergency service Line 112 provided by NCC? The Emergency Communications Centres (ECC) Project is intended to bridge the communication gap between the distressed and emergency response agencies in the country. The Nigerian Communications Commission has undertaken the task of facilitating the building and equipping Emergency Communications Centres in all 36 states of the federation and the Federal Capital Territory, Abuja. All telecom operators will be mandated to route emergency calls through the dedicated three-digit toll free number, 112, from each state to the emergency centre within that state. The operators, who are resident in the ECC will then process the distress call and contact the relevant Emergency Response Agency (e.g. Fire Service, Police, FRSC, Ambulance, etc.) whose primary duty is to handle the case. Numerous centres have been built and provided with equipment across the nation in all six geopolitical zones. Denmark (only in Danish, English, Swedish and Norwegian -according the european commission, not even German, however a neighbouring language - ) (including Greenland, Faroe Islands). Alongside 114 for non-emergency police. Israel (Redirects to 100 – Police – and will serve the planned unified center. alongside 100 for Police, 101 for Ambulance and 102 for Fire). In many countries, emergency numbers previously used also continue to be available; e.g. 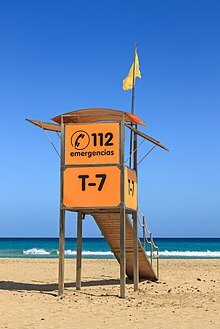 061 and 112 in Spain, 999 and 112 both function in Ireland and the UK. In the United States, only some carriers, including AT&T will map the number 112 to its emergency number 9-1-1.